Hey look, it's that being I saw back in 1992 who came and visited me one night. Recently I came across an article that was written by a woman who channels Mathew Ward. Who's Mathew Ward? He was a boy who died in the early 80's when he was 17. Years later his mother would learn how to channel her own son and the things he would say blew her away. How do I know it what he's saying is true? I don't, but something he said caught my ear, it was something very similar that I'd heard almost 30 years ago. 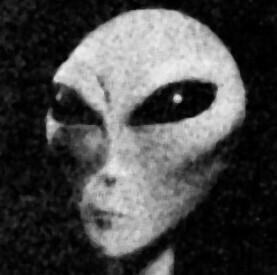 It was about a group of beings that are visiting us, known as the Greys, the same as the one shown in the picture. They are known as the group that abduct people, some have good experiences and some don't. Why do they do it? Why do they treat some better than others? And yet my experience frightened me at first but I came away thinking that this was a gentle being that could have easily harmed me and didn't. So why are there mixed reports? Maybe Mathew has an answer? If you read sights like Golden Age Of Gaia you will come away thinking that this is the year of disclosure, we are finally going to be told the truth about visitors from other worlds. I don't see that happening this year but we've seen a lot of great changes in a short time, so it's possible. Anything is possible. Maybe 15 years ago, before I started my podcast, a woman walked into my studio and told me that she was in Chicago at a convention and there were many E.T.s there, she said they looked just like us and were helping us move forward as a species. I wasn't sure if I believed her, not that the story was out of my belief system, but she just didn't strike me as being genuine. What if she was telling me the truth? Whether it's this year or not I do believe it will happen soon, and soon could be this year or in the next 20 years. I've talked to so many others who believe as I do, so many who've been taken felt they were being prepared for something bigger. I kind of feel that way as well, even though I don't believe I was taken, I was just visited. Scary? No, it really isn't. There are those who want us to be afraid of these kinds of things and yet I feel we have nothing to fear. Happy Solstice! Joy Melchezidek joins me for a special show supporting the divine feminie. In this show we are also joined by Gloria, Sherry, Susie and Barb, each are to her to share their experiences with different goddesses. I've learned to accept that there are many dimensions, and from my perspective there are many beings who are assisting us on our journey. And I know part of what I'm doing at this time is to help support the return of the divine feminine. Psychic/Medium Brenda Meadows reads for 3 women, 1 of which she knows a little, the other 2 she has never met. I'd say that's putting your neck on the line. Brenda always wants to deliver the best reading possible and get confirmation, that may not always be the case when you do readings. But, she nailed it again. Even psychics don't always trust what they're told, it just doesn't seem to make sense at times. In the end they just have to release what they've seen or heard, often it is proven accurate, sometimes it doesn't make sense. I've seen where it's been a couple of years before it made sense to the person getting the reading. It's not an exact science but I admire Brenda for being willing to do a show like this. I've worked with her long enough to know she is the real deal and she truly cares about others. Many of you are new listeners to my podcast, thank you to many of you who've shared part of your journey with me. This week I return to speaking with a channel. Some of you may not be familiar with that term. A channel is someone who allows another being to speak through them, we do this to gain truth and knowledge on a number of topics. This is always done out of love and light, never will you hear me endorse anything other than light. My dear soul sister Joy Melchezidek has been wanting to speak with Morgan Le Fay, the woman from the King Arthur Legends. I've learned to trust whatever Joy wants to bring forward because it is always from a place of love and there is always a deeper message for all. To be honest, prior to this interview I knew very little of Morgan, I know very little of King Arthur other than some childhood stories and the movie First Knight with Richard Gere. I know that I've always been drawn to that time period and maybe after this show I know why, I lived it. A couple of weeks ago I read an article about John F Kennedy being a part of the King Arthur story in a previous life, that is why they referred to his presidency as Camelot. A couple of years ago Joy channeled JFK and at the time I didn't realize why, now it makes sense to me thanks to what Morgan talks about in this show. It is said that there is a bit of truth in all legends. Could King Arthur be more than a legend? Was Morgan Le Fay a real person, was she a villian as portrayed in legends? After speaking with Morgan, I took away from this interview that she is a strong and compassionate being who is here to speak the truth and anchor the Divine Feminine. I am of the belief that there was a time when women were complete equals and several thousand years ago an agreement was made to allow the Earth to become a partriachal society. The Divine Feminine left, and now what we're seeing is the return of the Divine Feminine and this is being done to balance out the Divine Masculine, to return this planet to a place of love, peace and compassion. We've been ruled by wars for so long, controlled by others, and enslaved into our limited beliefs. Even though it appears that things are horrible in the world today, there are many things that go unreported about the great strides that are being made to change things. People are waking up all over the world and demanding change, often it is led by women because generally they are more in tune with higher consciousness. Please welcome my dear friend Joy and apparently another dear friend from another time, Morgan Le Fay.